Let's find a house and make it your home. Lara brings her positive cheerful attitude to the real estate business. Born and raised in Edgewood, KY, she has established a far reaching and experienced network across the Northern Kentucky Area. Her values, integrity and deep commitment to family are at the core of both her personal and professional life. Lara is a quick thinker who loves helping people fulfill their dreams. Her passion is to ensure your happiness. Whether you are buying or selling, Lara is the perfect realtor for you. 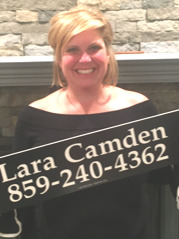 Give Lara a call and you will quickly realize that you have a realtor for life. "Lara made this process so easy for us, even though we knew our house was not ready for selling. We knew when we first met that she would give us the best advice and help us. We are truly grateful for everything that she did, and highly recommend her."